Allowing our imagination to stretch unthinkably far back in time, we must consider what may have been the state of elements that billions of years ago might have given way to even stranger physical substances and processes. Here, somewhere near the Eagle Nebula, millions of light years away, such forces that defy our understanding may have occurred and still might be active. Lifeless landscapes that through time might ultimately give way to life. In this case, large domes, almost perfectly formed in environments of low gravity, allowing for the rise of hot gases pushing upward through soft surfaces, are being mixed with other elements that produce very flexible materials which harden when exposed to the cooler atmosphere above. Some of the domes collapse and rupture with the inner hot liquids escaping through the broken shells. Some of this early atmosphere can be seen lingering in acidic layers of foggy and perhaps toxic gases that drift in the still absence of winds. The domes may reach enormous dimensions as indicated by the mountain-sized collapsed one in the far horizon. 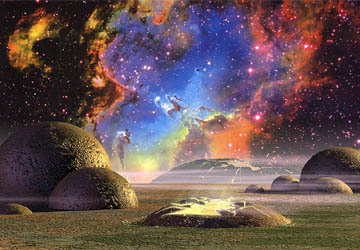 This hostile-looking landscape might finally wear smooth through time, with the development of a moist and cooler atmosphere, the domes remaining, long solidified and inactive, with lush vegetation growing over them. They may appear then as almost perfectly smooth hills or become shelters for strange life forms that evolve much later.